I put on every layer I had, ready to start climbing. Angela had Emanuel as her guide and I had Eli, so that we could go at our own pace. We climbed very slowly, taking one step at a time. It was the night before the full moon (I think) and so I didn’t even need my headlamp; we were guided by the light of the moon. I have no idea how long we were climbing for, but we went from steep trails to zigzag scree. After a while, I could look down and see the headlamps of others directly below me and knew that one wrong step would send me plummeting down the side of the mountain. I’m not sure of the time, but about ¾ of the way up, I started feeling sick to my stomach. I quickly got water from Eli and started to feel better immediately. I continued climbing but about 30-40 minutes later felt confusion between needing to pass out or throw up. Eli told me that I was ok and told me to force myself to vomit. I got a little bile out and continued up, but I was not doing well. It was everything I could do to put one foot in front of the other and move forward. 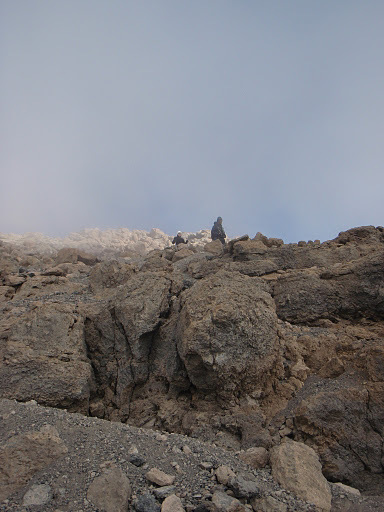 The last scramble over rocks brought us to 5685m and Gilman’s Point. It was amazing how fast the sun rose; within minutes it went from dark to daylight. I remembered our briefing before the climb. We were told “Whatever you do, don’t have a nap at Gilman’s Point no matter how tired you feel”. Now I knew why. 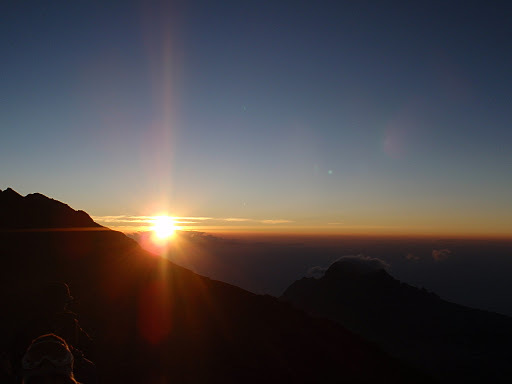 Not only was it unsafe to nap at such a high altitude if I was feeling the effects of altitude sickness, but I would miss the sunrise, which was worth every penny I paid for the trip just to experience. 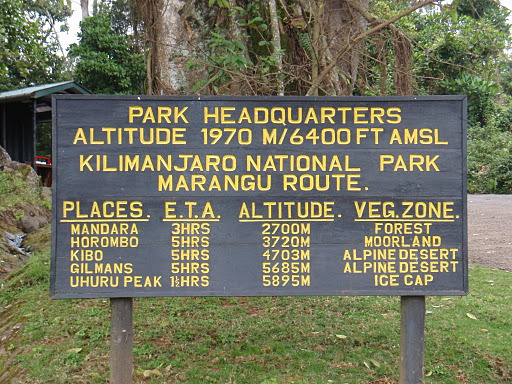 Eli thought I was fine to continue to Uhuru Peak, although I wasn’t quite sure. 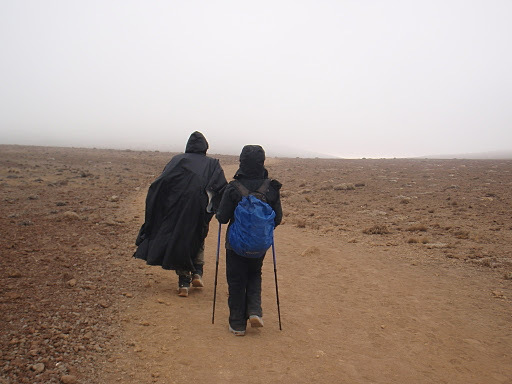 He took my arm and we began walking slowly toward our final destination. He was telling me to look back at the other climbers, reassuring me that I wasn’t the only one having difficulty. 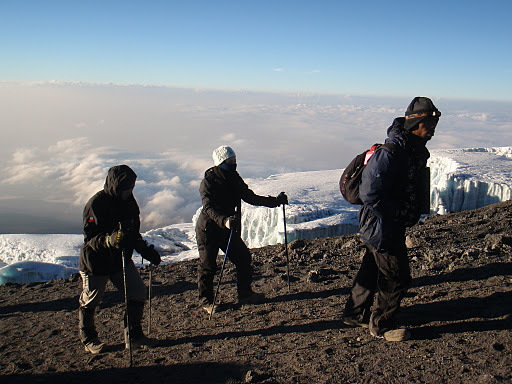 We passed an American man coming down who said it was his twelfth summit of Kilimanjaro. I remember thinking to myself “Why?” It took another two hours to get to Uhuru Peak (5896m) and I couldn’t believe how crowded it was! People from every nation waiting their turn for a photo op by the summit sign. In my itinerary, it says “spectacular glaciers that still occupy most of the summit area”. It was a spectacular glacier that BARELY covered any of the summit. There was no snow or ice anywhere we walked, and the effects of global warming were evident. This mountain may not see any of its glacier left in the next 10-20 years. It was truly a beautiful yet sad sight to behold. The air was thin, but I barely noticed in my excitement to capture every bit of the experience. The summit was buzzing from the energy of all the tired climbers realizing their dream! We began to head back down and after scrambling over the summit rocks I was instantly glad that we did our ascent in the dark. It was super-steep! If I had seen that hill, I would have surely been demotivated to continue! Eli grabbed the back of my shirt and we slid down the loose scree like we were skiing. It was a lot of fun, and the lower we went, the better I began to feel. But when I got back to Kibo, I had a brutal pressure headache and severe chills. I couldn’t get warm until I started moving, had to take Motrin for the headache but couldn’t eat barely anything. Eli explained that it was normal to feel this way. We spent the night at Horombo Hut and ended up sharing with two Slovakian soldiers that we shared with at Mandara. One of them summited. 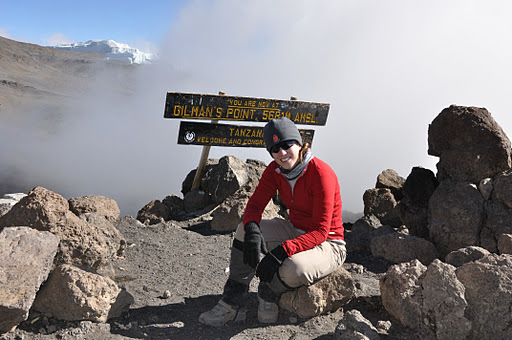 A Canadian girl named Leah also didn’t make it, but a 62-year old woman ticking off items from her bucket list made it! I was really impressed! Our team! Eli and Emanuel were great and encouraging the whole way! I might not have made it if it wasn’t for them! Back to Springlands for a hot shower and rest! We were lucky on the way down to walk through a part of the rainforest teeming with monkeys. I learned “Safari n jima” which meant “Good Luck” and I said it to everyone climbing up. We made it to the gate and “Maliza!” we were finished! Eli told me after that he was worried that we might not summit because the night before saw a 50% success rate. Angela had been taking Diamox since day 2 because she was feeling sickness the first day. I didn’t take any altitude drugs and had a bit more trouble at the end, but made it anyway! I gave the North Face jacket I was wearing to our waiter/porter Fide. The whole tipping situation concerned me. Before our climb they handed us a tipping sheet with guidelines on what was expected. If I was on my own I would be expected to pay per day: $20 to the guide, $10 per porter (x4) and $15 to the cook for a TOTAL of $345!!!!! This on top of the $1000+ I paid for the climb! I simply could not afford to tip that much. I don’t know where the money from these organized climbs goes, but the tipping expectation was a bit much. A couple from the UK, who the husband climbed had the porters/guide demand tips from them on the mountain. If that had happened to me, I wouldn’t have tipped at all. Angela and I had dinner, sorted out when we could afford to tip and then I met with three Americans and a Swede who turned out to be the owner of Zara and Springlands. He met his wife on a plane and in the 80’s as she was working as a travel agent in Tanzania and they were unable to book clients because the hotels were full, they decided to build their own. Over the years it expanded with more buildings and the pool to be what it is today. I was telling the story of my summit and mentioned that I met a crazy man who claimed he had summited twelve times! They all laughed and one of the Americans, Macon Dunnagan told me that he was the one that I saw! 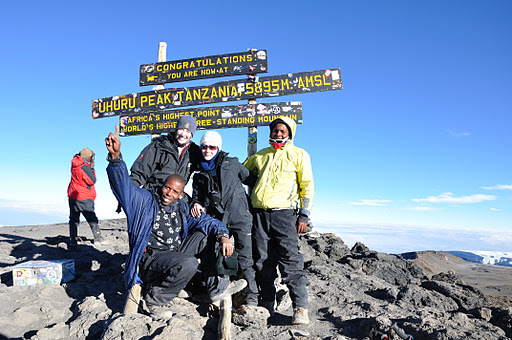 His wife had died of ovarian cancer and he carried her ashes to the top and buried at Uhuru Peak. He asked me if I had called my mom and told her of my achievement and when I informed him I hadn’t, he handed me his cell phone and told me to. From Africa! It’s incredible the amazing people you meet around the world when you’re travelling! This photo is deceiving, but it’s actually taken pointing up at the sky. This gives an idea of how steep it was going up AND back down! We’re on the moon. It started raining for the first time of the whole trip on the way back down. We were pretty shocked by the tipping situation as well – were taken very much by surprise – that’s the one tip I give people when they ask about the cost.